Boil water in a deep pan, add pasta and salt and cook for 8-10 minutes or according to the package instructions. Drain the pasta and keep aside. Heat oil in a pan, add crushed garlic and fry till light brown. Add sliced chicken pieces and stir fry for 5 minutes. Now add crushed pepper, salt, crushed red chilly, oregano, soy sauce and chilli garlic sauce and stir well. Add tomato paste, 1/4 cup water and vinegar, mix well. Now add capsicum, sweet corn and honey ,mix well and cook for 2-3 minutes. Yum yum, drooling rite now here, one of my fav pasta. Nice! The sauce has so beautifully covered the pasta. mouthwatering dish here. Delicious and super tempting Pasta.......my fav one. Very yummy & mouthwatering pasta!! Oh yum! I haven't made pasta for so long, thank you for the reminder! This looks great! 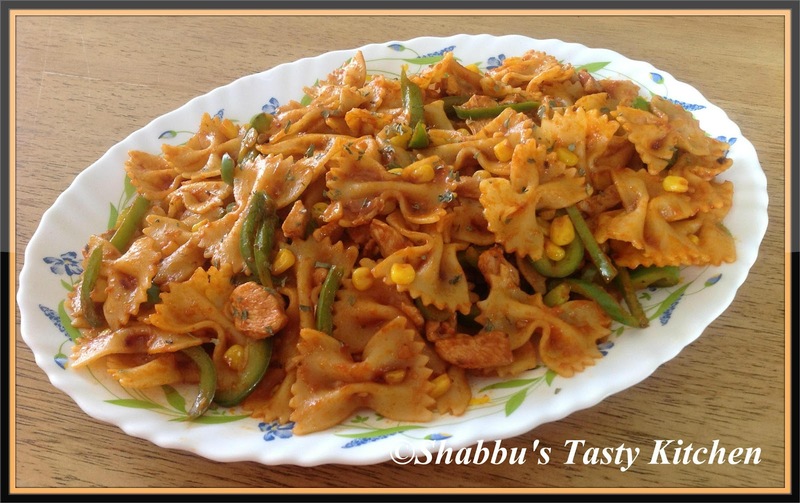 My weakness pasta :) its looking very scrumptious!! What nice and yummy look this! !